It is dissertation defense season, and my plate has been full lately, so I apologize for slacking off here. I have been trying to read this book for weeks now, and I am glad I finally did. To Kill A Mockingbird is one of the most read and also most challenged books in the USA. It is a novel I have read a few times, and there was at least one point in my life when I would have said it was my favorite book ever. I have to admit, there were moments of nostalgia that tweaked me here and there in reading this very faithful and well rendered adaptation. It hews to the original, in its well researched illustrations as well as use of original language from the book (Yes, the n-word is in there, and they provide a justification for its inclusion in the endnotes). All of this to say that the potential problems people have with the novel also exist for those who would read this graphic novel. The "white savior" narrative is still pervasive, but in this go-through I also noticed how much it highlights feminism and the role of women in this community, something I do not see given as much attention when discussing this book. The family dynamics also touched on my heartstrings, and I admit I did get misty eyed at the last pages of the book. It is very well paced as an adaptation, top notch work all around. Still, there is a part of me that wonders why this adaptation exists. TKAM is one of the most-read and taught books in the country. There are millions upon millions of copies of it in libraries, classrooms, and in people's hands already. I guess having a graphic version of this book makes it available to some readers who might not want to tackle the novel, but I I have to say that I still found this version to be a time-consuming read. 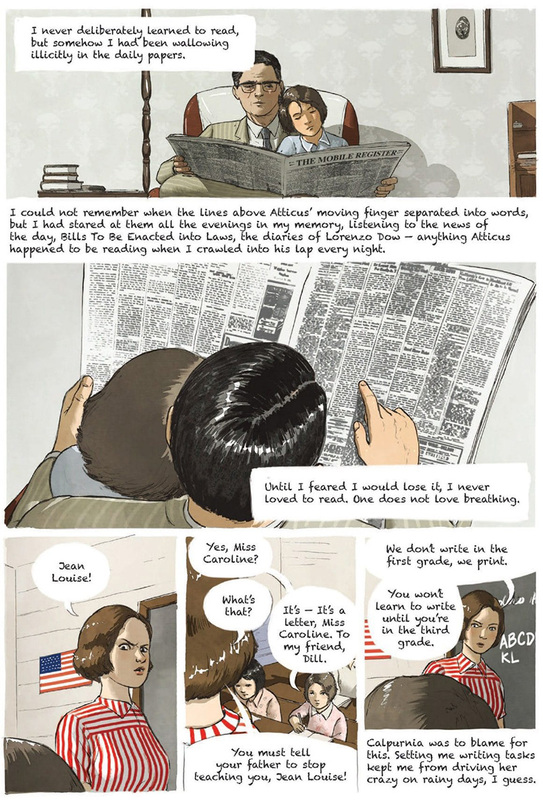 It is text-heavy for a graphic novel, with the text mainly displayed in caption boxes. It is not "easy reading, " which is often the rationale for making a graphic novel version. 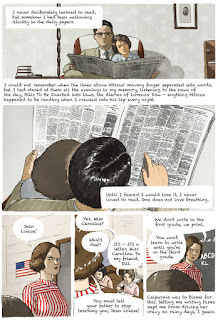 I get why some of the other adaptations I have recently reviewed exist: The Giver is pitched at YA audiences and graphic novels have proven a popular format for that age group; Anne Frank's Diary carries of the weight of not only being a literary text but also one tasked with preserving people's memories of the Holocaust. I guess it is a good commercial decision to adapt TKAM, as I imagine libraries and schools will snap up this version. But as much as I liked it, I still ended up asking myself if it was necessary. Perhaps as an answer to my question I can say that reading this book has dredged up all kinds of contrary and ambiguous thoughts, which I feel in many ways is the hallmark of a powerful book. In that way, I say this graphic version is successful. Harper Lee, of course, wrote the original novel on which this adaptation is based. For it she was awarded a Pulitzer Prize and a Presidential Medal of Freedom, which is remarkable given this was the only novel she published in her lifetime. Fred Fordham adapted the book here, and he has another graphic adaption, of Phillip Pullman's The Adventures of John Blake, to his credit. He has also created an original graphic novel Nightfall, which is currently available in French. He speaks about his work in adapting TKAM in this video. All of the reviews I have read about this book have been positive. Esther Keller wrote, "The color on the artwork is what struck me most. I expected black and white pencil drawings, which would evoke the Gregory Peck movie. Instead, bright, soft colors are used. It works. It’s beautiful." Publishers Weekly called it a "thoughtfully crafted interpretation" and summed it up, "More loving remake than revelation, Fordham’s adaptation may be scrutinized by Lee’s fans, but does sufficient justice to her portrait of injustice." CJ Lyons declared it "a worthy partner to the original, providing a clarion call for civility, equality, and justice for all." 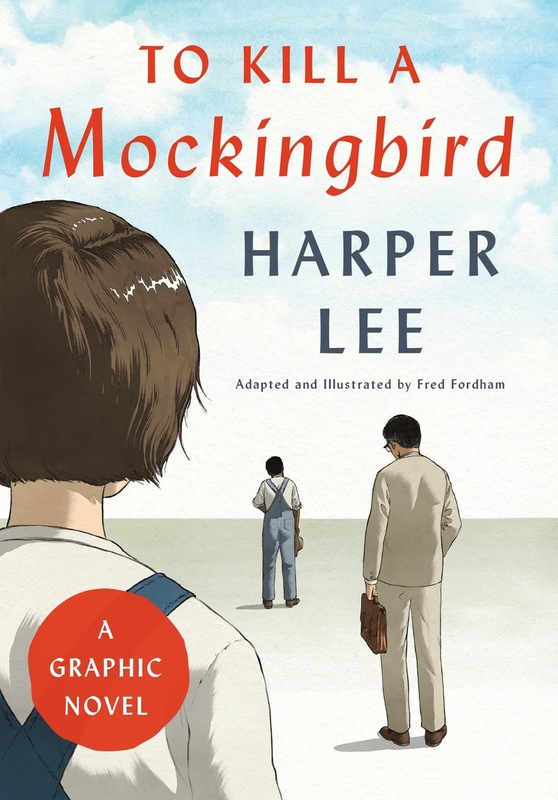 To Kill A Mockingbird was published by Harper Collins, and they offer more info here.